Here's a decadent treat for the holidays. Rich creamy simple chocolate fudge involves very less work without compromising the texture and flavor. I like to add walnuts, pecans, pistachios and almonds to mine to give it that extra crunch. You can add any combination of nuts you like. 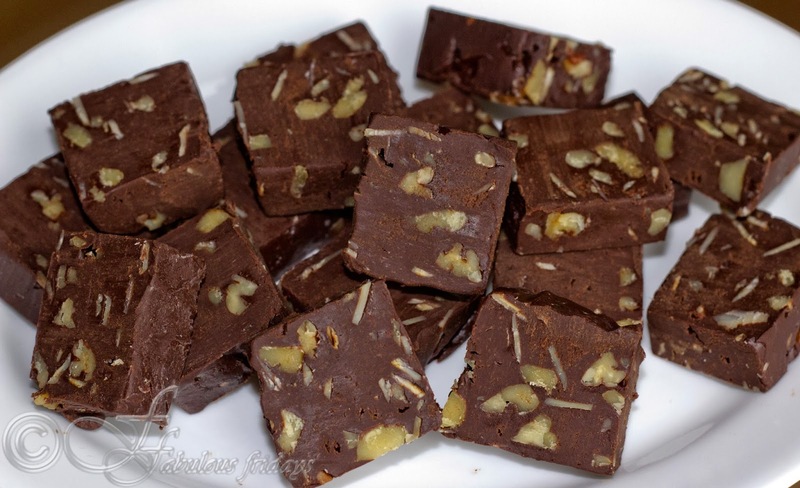 If you find the traditional way of making fudge a difficult task then this recipe is for you. It involves using condensed milk as a ready made sugar syrup base. Use the best quality chocolate you can find, because the final taste will depend on it. I used unsweetened chocolate, but you can choose between semi sweet and bitter sweet. Toast the nuts in a pan or oven till lightly brown and fragrant. Cool and chop coarsely. Keep aside. Line a square baking pan with foil or parchment paper. Combine the condensed milk, chopped chocolate, and butter in a heatproof bowl and place over a saucepan of simmering water. Melt the chocolate mixture, stirring frequently. Make sure the mixture doesn't get too hot or the fudge may be grainy. Remove from heat and stir in the vanilla extract and chopped nuts. Spread the mixture in the prepared pan, smoothing the top. Cool at room temperature for about 4-5 hours. Remove the fudge from the pan and cut into small pieces. Store in the refrigerator.